JNN 25 April 2014 Gaza : Rival Palestinian leaders from the West Bank and Gaza Strip have decided to form a government of national unity within the “next five weeks”, officials said early on Wednesday. The agreement, between members of the Palestinian Liberation Organization and Hamas, was reached following talks in Gaza City which began on Tuesday evening, a member of the PLO who wished to remain anonymous told AFP. “There has also been progress on the holding of future elections and the composition of the PLO,” said the Palestinian official without giving further details. Talks, which are taking place behind closed doors, are expected to continue throughout Wednesday. Fatah, the PLO’s main component, and Hamas signed a reconciliation accord in Cairo in 2011 aimed at ending the political divide between Gaza and the Palestinian Authority-ruled West Bank. 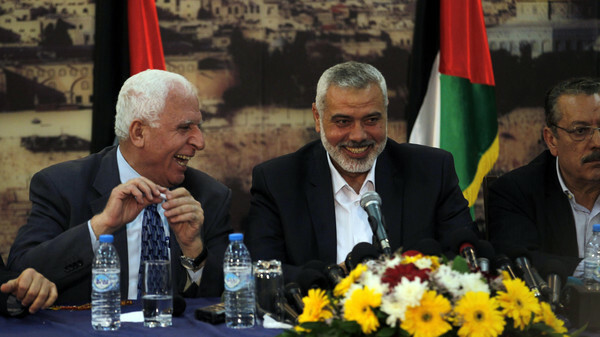 Azzam al-Ahmad, a senior figure in president Mahmud Abbas’ Fatah party, led the team which were greeted by Hamas prime minister Ismail Haniya and the movement’s deputy leader Mussa Abu Marzuq. Haniya had earlier called for cementing Palestinian reconciliation “in order to form one government, one political system and one national program”. The latest announcement of a deal comes as U.S.-brokered peace talks with Israel teeter on the edge of collapse. The Palestinians met just a week before the end of a nine-month target originally set for an Israeli-Palestinian deal. Meanwhile, President Mahmoud Abbas said Tuesday he will disband the Palestinian Authority, forcing Israel to take over governance if bilateral talks fail. He also named the terms for the extension of negotiations with Israel past an April 29 deadline. Israel will be left to govern a population of over 2.5 million in the Palestinian territories, taking charge of security issues, healthcare and the economy of the area, if talks fail, Abbas threatened, RT reported. The warning comes after reports over the weekend that Abbas was considering dissolving the Palestinian Authority if the April 29 passes without any developments. “If the negotiations stop, it’s the Israeli government that will bear the responsibility for the economic situation and the paying of the salaries of (Palestinian) employees, workers and farmers, for health and for education just as it did before the establishment of the Authority,” he told reporters visiting his presidential headquarters in Ramallah. “Also, it will bear responsibility for security, meaning Israel will bear full responsibility … We hope that we won’t come to this period but that we come to solutions,” he said. U.S. State Department Spokeswoman Jen Psaki said the disbandment of the Palestinian Authority would have serious implications for Washington’s relations with Palestine. Israel called off a session of talks in response to the deal with the Gaza-based Islamist group. Abbas later issued a statement saying the unity pact did not contradict peace talks he is pursuing with Israel. He said that an independent state living peacefully alongside Israel remained his goal. Earlier Wednesday, Israel’s Prime Minister Benjamin Netanyahu cautioned Abbas regarding the unity talks with Hamas, saying Abbas had to choose between peace with Israel or its Islamist enemy. The new bid for reconciliation coincided with meetings between Palestinian and Israeli negotiators to try to extend U.S.-sponsored peace talks beyond an April 29 deadline. Sources from both sides said strong disagreements remained, after they convened in Jerusalem on Tuesday. “You can have one, but not the other. I hope he chooses peace. So far he hasn’t done so,” he said. Abbas’s spokesman, Nabil Abu Rdeineh, said Palestinian unity was an internal matter. Shortly after the announcement of reconciliation, Israel launched an airstrike on the Palestinian enclave, wounding at least a dozen people, Reuters news agency, quoting medical officials and Israeli reports, said. Health Ministry spokesman Ashraf Al-Qidra said the air strike wounded 12 people, all of them civilians, among them children between the ages of five and 12, as well as adults. This entry was posted in Middle East and tagged Fatah, hamas, Mahmud Abbas, Palestinian Authority, president mahmoud abbas, Sign Accord. Bookmark the permalink.